Trying to determine your unique essential oil blend can be overwhelming (and expensive!) for a first-timer. Let this page boost your confidence and give you a starting point. Ultimately, let your nose be your guide. 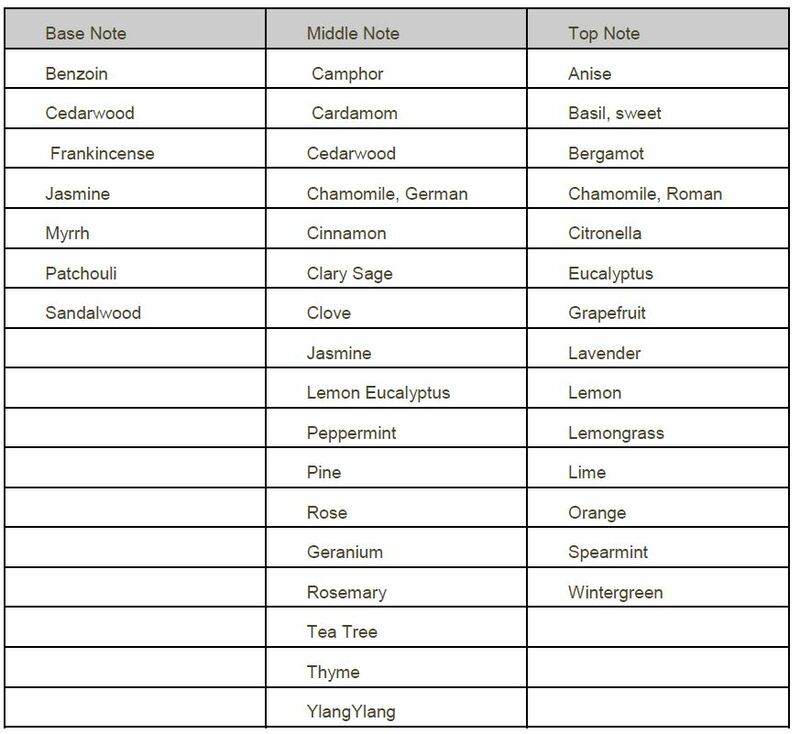 Essential oils (EOs) are categorized by “notes”: Top Note, Middle Note and Base Note. Essential oils can move between two categories. Base Note EOs are the long lasting notes. The scent will linger long after the top notes have faded away. Be careful with these as they can overpower the blend, and are usually the most expensive. Start with a base note, then add your middle notes and finally your top notes. Middle Note EOs add body and warmth to a blend. You’ll find your heavier florals here. Most essential oils fall into this category, although they may be listed toward the top or bottom of this category. Top Note EOs evaporate faster than middle and base notes. 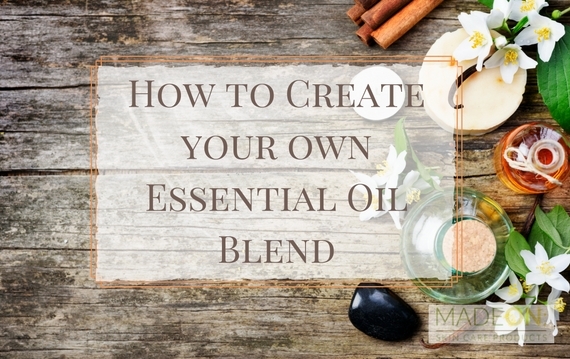 Of all the notes, this category can have more drops of EO in your blend than the other two categories. Top Note EOs are usually light and uplifting scents, and they’re usually the notes you smell first. They tend to be light florals or citrus. Essential oils are the liquids that are extracted from many parts of plants. An entire plant, when distilled, might only produce a drop of essential oil, which is why they are so potent. Here are the major group categories: Citrus, Flowers, Exotics, Resins, Spices, Trees, Herbs. To create your signature perfume, use this ratio of base/middle/top: 1:2:4 Translate those to 1 drop of base, 2 drops of middle and 4 drops of top to start with. When you have the fragrance you want, multiply that to create your essential oil base for your recipe. Use this guide as a starting point; you’re absolutely free to change the amount you put in your own personal blend. Your nose is your guide. Don’t forget to have a small cup of coffee beans on hand to clear the nasal palate between sniffing fragrances. This clears the nose from previously inhaled scents. When shopping, be careful to check the ingredient list of the essential oil you buy. You won’t find an affordable pure vanilla or jasmine essential oil. They are usually blended with another oil. Make sure that alcohol is not listed as an ingredient. Use this chart below to create your own essential oil blend. Look for more essential oil ideas, and recipes, in the My Buttered Life: Personal Edition ebook.